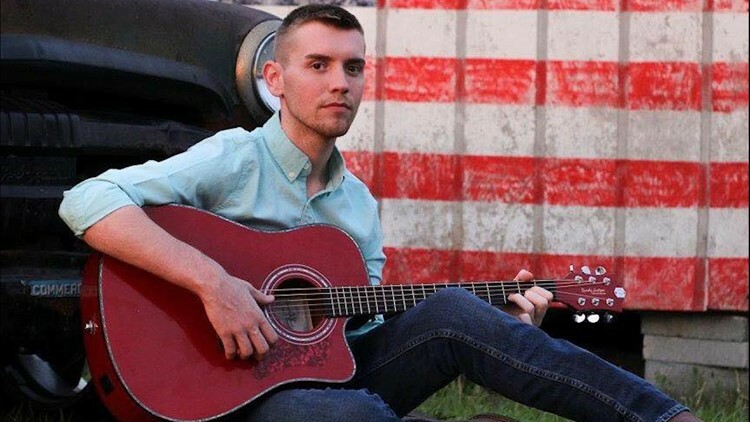 DURHAM, N.C. — On his eighth day hospitalized, Dustin Chapman decided to put his musical talents to use and help inspire others who, like him, were struggling with a difficult medical diagnosis. Chapman was diagnosed with a rare esophageal disease in 2015 making it difficult for him to eat and drink. According to the Mayo Clinic, achalasia results from damage to nerves in the esophagus preventing it from squeezing food in the stomach. On top of that, Chapman was later diagnosed with cricopharyngeal dysfunction causing further discomfort consuming food. For Chapman, it caused him to have intense hiccups and vomiting when he tried to eat. Since his diagnosis, he has undergone six surgeries with no real relief. While dealing with the difficulty of the rare disease, the 21-year-old has been enrolled in Catawba College in North Carolina as a music major. He has continually leaned on his love of music and songwriting throughout the difficult medical journey. So, it came as no surprise that, to pass the time during a 16-day hospitalization period at Duke University Hospital, Chapman turned to songwriting. "[The song] has a religious theme throughout, like, trusting in God's plan," said Chapman. "I may not understand his plan but what he has in store is greater than anything I can imagine." Chapman created the song "Lead the Way" and wanted to perform it. He sought out the piano in the hospital's cancer center. Little did he know the song and his performance would benefit far more than him. "Seeing everyone around [the cancer center], this song is something I wrote for me but I realized it could touch these people, too," said Chapman. Duke University's Cancer Center is a multi-story, open area with the piano in the center on the main floor. As Chapman began to sing, the stunning acoustics were nothing like he had experienced before. The performance caused the entire center to pause, with a crowd gathering around the piano and on each level of the cancer center's floors. "The song traveled all the way up and, when I was done, I looked up and people on every floor were looking down and everyone started to clap," recalled Chapman. Chapman was met with reactions to his performance for the remainder of the day. He recalled other patients telling him how much the song inspired them to stay strong. He hopes his music will show people that no matter what they're going through, there's something they can hang onto that has joy and happiness and can bring them peace - much like music brings to Chapman. Despite a series of intense medical treatments, Chapman has had no relief from the hardships of his disease. After graduating from college in May, he will receive a feeding tube that he hopes will help provide ease. In opening up about his disease, Chapman hopes others will similar symptoms will seek treatment. For more information on achalasia, click here. To listen to Dustin Chapman's music, visit his Facebook page or website.